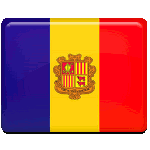 People of Andorra annually celebrate National Day on September 8. This holiday is established to honor of Our Lady of Meritxell, the patron saint of Andorra. Our Lady of Meritxell is a statue depicting an apparition of the Virgin Mary. The statue dates from the late 12th century, but it was burned on September 1972. Nowadays its replica can be found in the Meritxell Chapel, that was build in 1976. According to the legend, the statue was found by villagers from Meritxell under the blooming bush of a wild rose on January 6. The villagers took the statue to the church, but the next day it appeared again under the bush of rose. The villagers decided to build a new chapel on the place, where the statue was found. When the chapel was completed, they found out, that its open space was miraculously untouched by the winter snows. The feast of Our Lady of Meritxell is a national holiday in Andorra. People have a day off, governmental offices are closed. Various events and activities are organized to celebrate National Day.